With the passing of the Municipal Forest Act in 1931, schools across Michigan were deeded surplus forest land to be used for the benefit of students’ education and the wider community. As priorities and trends in education and society as a whole have shifted, many school forest properties have been neglected, largely underutilized and even forgotten by school districts. As community partners to schools, conservation organizations can play a vital role in re-connecting schools to the stewardship of these underutilized resources. In turn, full and sustained use of a school forest by educators and community organizations can create a new generation of conservationists with a sense of place and purpose from their experiences in a school forest. Case studies, best practices and resources for engaging with schools in the stewardship of their forest properties will be presented. 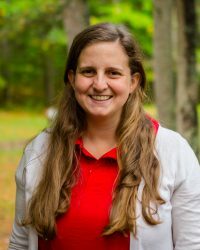 Emily Vogelgesang is the Environmental Education Coordinator for Huron Pines, a conservation nonprofit established to protect, restore and conserve Michigan’s natural resources. Our work across Northeast Michigan’s forests, lakes and streams improves economic, environmental, educational and recreational opportunities in communities throughout our region. Emily coordinates opportunities for students across Northeast Michigan to engage in the stewardship of local resources along side community partners from all sectors. With a background in ecological engineering and a passion for empowering all generations to care for their local resources, she works to elevate student voice in conservation efforts and plan for the long-term sustainability of projects with the teachers who implement them year to year.